A Commission is a journey and changes lives. You just don’t know just how perfect “Focus” is me. Living a solitary life, I focus on the good that surrounds me. Found the perfect piece, “Unity” reminds us of the Ying and Yang in our relationship. Without our differences, life would be boring. I've been thinking much more on the photos and your narrative of “Taking of a Soul”. Upon reflection, "Soul" is all about what we discussed for over two years. I asked you to do something that invokes Natives and their association with nature, wildlife, and the spiritual world they once lived in. I now fully appreciate that you went well beyond my request. You gave me exactly what I asked for and much more; you pushed the envelope. Never occurred to me you would give me wolves and other wildlife by using their skulls to achieve my vision! Brilliant. We are always careful not to buy to many works by one artist, but for some reason we keep finding sculptures of yours we love. I have shown Lineal Passage to friends and they have been very impressed by this glorious piece. They ask me about the birds: are they carved from a different wood and placed there or are they carved right from the natural wood? The question is prompted by how seamlessly they are placed. I said I would check, but suspect they were added to the piece. Ken would have to be an alien from another universe to carve it from the raw wood. What a sense of humor you have. We love Opulence and Essential. We were drawn to the sculpture, and sharing your story just made it real. 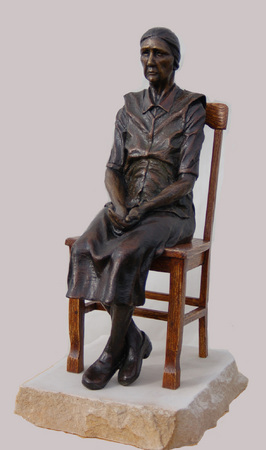 Our first sculpture—Observing Grace is being moved daily to find the right place for this amazing sculpture. We love it. Showed my friends your sculpture I purchased at the King Mountain Art Fair, they loved it, but even if they didn’t, I would still love Unity. Attendance Study" arrived yesterday and love it! 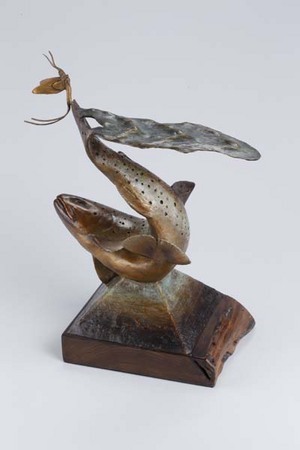 One of the cool things about this small sculpture is the fact that there is no "front" or "back"--it's equally interesting from all 360 degrees. We just purchased one of Ken’s works - Tale of Respect. Thrilled to have such a beautiful piece of art. Unsurpassed craftsmanship! The bird arrived safe and sound, we love him, and He sits on our coffee table in our Texas beach home. We’re still thoroughly enjoying Forever Ready (we haven’t caught him napping yet!) We hope you’ll be out in Connecticut (or at least New England) sometime soon. Can’t tell you how much we are enjoying Composed at our home. It is a wonder of beauty and grace. I’ll never tire of it. Thanks so much for your talent and vision. "Even with two and a half years of yoga, I’ve never gotten close to that position—she must have been a very limber model. We are looking forward to adding The Stretch to our collection." 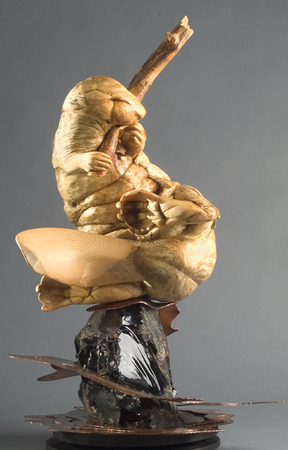 "Ken translates brilliant observations into awe inspiring sculptural work in both wood and bronze. He floods you with emotion in each piece. Whether it is the graceful twirling of a beaver munching on leaves, a bird preening, or a man weary beyond his years, his work speaks to the soul. In order to fully appreciate each creation you must hear his story of inspiration and vision. It will make each sculpture come to life." Thanks, we just love Certain Destiny, The Redwood Salmon. We named her Sally! "I received American Pi – Sunday's Dress and I LOVE it. My husband loves it too." "The Tale of Respect looks fabulous on the Grand piano. Many thanks!! I love it!" "I finally found you, lost your card and I found it two years later, I love my new sculpture - Well Worn”. "Thank you for sharing your art, it is so sensitive and original… and superb!" "I could feel your passion for your art as you explained your work to us." "I love the complicated postures, very creative and interesting pieces." "Where does one know how to do this?" "Wonderful use of raw forms of wood." "Thanks for the eye candy." "I appreciate you working with me to insure I could purchase Well Worn for my wife’s birthday, I wrote a Haiku and read it to her, then I told her to turn around and she saw the sculpture. Thank you! " 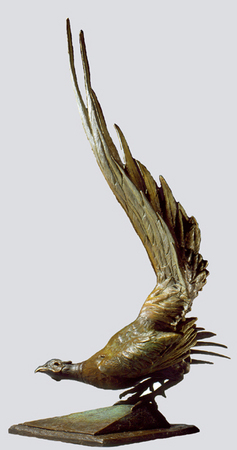 Mom always called us her little sparrows; your sculpture will always remind me of her. We are so delighted to have so many Newman’s in our home. Who will we will them to? This is a very powerful and compelling piece! You have really expanded your range over the years. I can’t wait to receive A Moment’s Rest. Thank you for the lovely sculpture, my husband loved One After Another. I just ordered a new pedestal for a sculpture I purchased from you years ago. Thanks for your article on placing sculpture in your home, it made all the difference. We immediately uncrated Forever Ready; it was even nicer than we remembered. For the moment it is on the dining table overlooking the lake, we plan to move it to our office conference room next week. Thank you for making this possible. 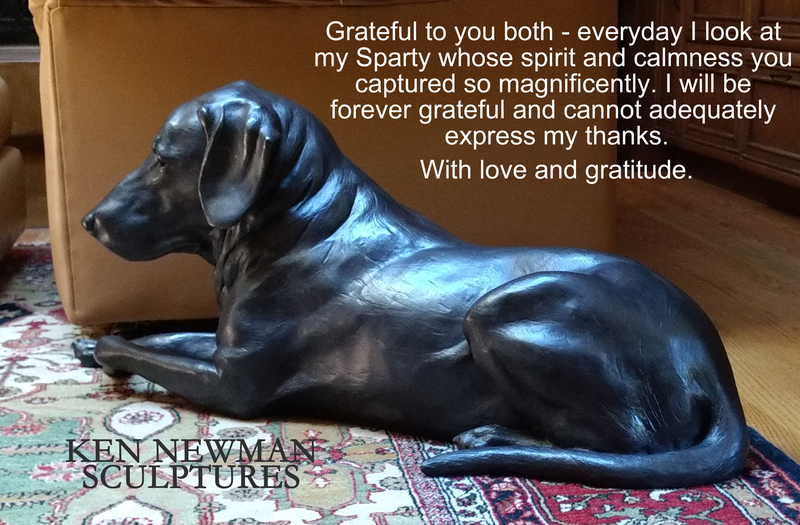 Thank you all for sharing your home or business through the placement of our sculptures and kind words as we continue the journey - these words make it rewarding and real.